Spring is officially here which can only mean one thing - it's time for Spring Cleaning! Spring cleaning with kids can be stressful but with our tips, kids will not only learn about doing chores, help you and have fun! -Set Expectations Early. Make it a date with your children! Let them know a week before and remind them. Let them know it's a team activity that you will be tackling together. Pump them up by letting them know everyone's help will make a big difference. -Get Kids Involved in the Planning. Kids like to make their own plan vs. being told what to do. Have them go through their room and see if they can make a list of things that need to be done. You can even treat it as an 'iSpy' type game. Work together to make a list of all your tasks. -Let Them Learn. Try not to micromanage, show them how to do a task and then step back to let them complete it on their own. Once they've finished, be sure to praise them on a job well done and show them any corrections as needed. You don't want them feeling discouraged. -Have Fun. Cleaning a house can literally be a chore – but there’s no reason why a little fun can’t be added to the work. Cleaning up is so much easier in our house when the kids are able to listen to music in the background. Other ideas for lightening the workload include playing games such as “I Spy” or creating a story with each person taking turns contributing the next word. -Take Your Time. You may not be able to tackle everything at once and that's ok! Make a schedule for the day and schedule a fun break in between or spread it out over a few weekends. -Celebrate! Once everything is completed, celebrate! Treat them to a fun night out, a toy they've been wanting or whatever you'd like. 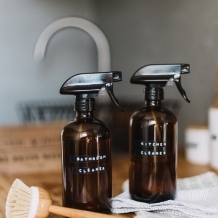 Be sure to thank them and show them how nice it is to reap the rewards of a clean, organized home! Another great thing to try this year is this Chore Kits with Printable. Not only will a list help keep them on track, but they will also love having their own little kit!